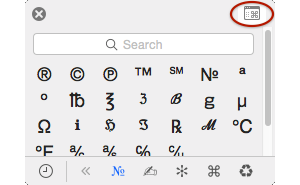 Whether you’re a touch-typist or a hunt-and-pecker, you simply can’t access the full power of your fonts with just your keyboard. Even the first Macintosh was designed to encourage font finesse, and today’s Macs go even further by providing deep access to the thousands of characters and advanced features in modern fonts—if you know where to look. Thankfully, you don’t need an expensive design application from Adobe or Quark to find and use this font magic. Apple’s apps, like TextEdit, Pages, and Keynote, include a floating Fonts window that’s packed with features we’ll explore here. 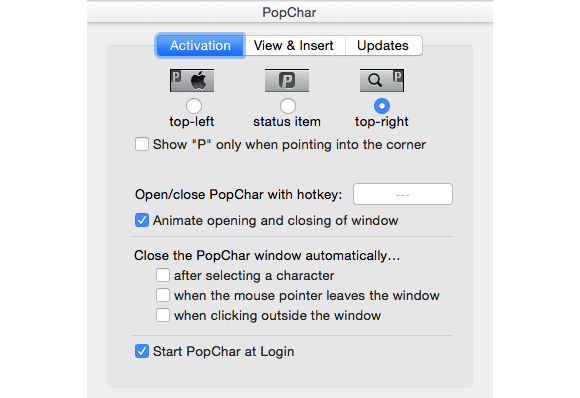 But if you find yourself using these features often, then a third-party utility such as PopChar 7 (which is celebrating its 25th anniversary!) will make your character-finding tasks even easier and a lot more entertaining. 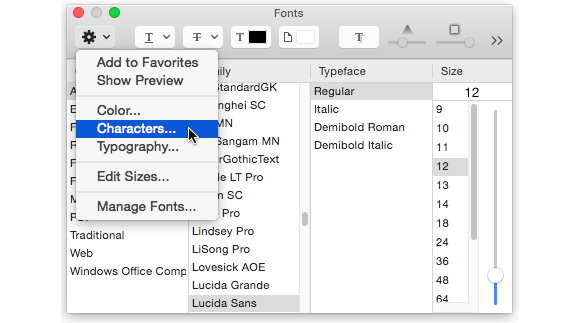 When using TextEdit, Pages, Keynote, Numbers, or any other Apple application that has a Format menu, you can open a supremely powerful Fonts window by choosing Format > Font > Show Fonts (or Command-T). Look here for the Fonts window, or press Command-T, which is faster. 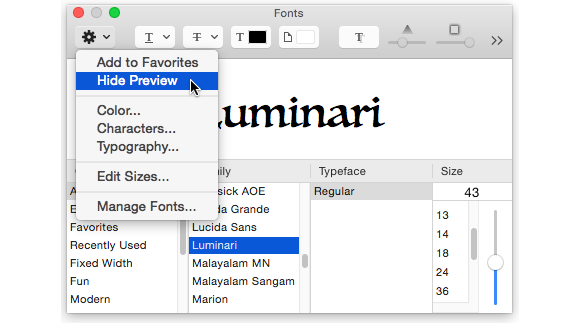 At first glance, the Fonts window seems to only show a list of fonts, styles and sizes. But lurking under the Action pop-up menu (it looks like a gear sprocket) are several doorways into font fabulosity. For example, the Fonts window doesn’t normally show a preview of a selected font—for that, choose Show Preview (shown here as Hide Preview because the Preview is already showing). See a preview of any font, and adjust its size with the slider on the right. When you need to find a character (or glyph, as it’s known in the world of typography), just choose Characters from that same Action menu. 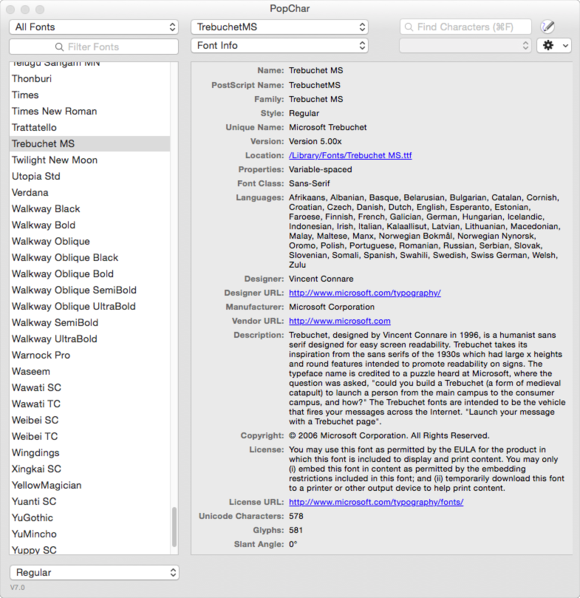 The Characters window lets you easily find any character in a font, either by typing into the Search field or by choosing a category from the left panel. Conveniently, the characters are displayed in the font that’s currently active in your document—in other words, the font that would be used if you just continued typing. But even more conveniently, the Font Variation area in the lower-right part of the window also shows that same character in your other active fonts. When you find what you need, a simple double-click pops that character into your document. If you find yourself using a specific character often, add it to your Favorites by clicking the Add to Favorites button beneath it. The categories in the left panel of the Characters window show you groups of related characters, such as the circle-P for Sound Recording Copyright. The Pictographs and Bullets/Stars categories are especially fun. If the Characters window is a bit too large for your taste, you can minimize it by clicking the icon at the upper-right. The minimized Character Chooser window. Click the icon at its upper-right to expand it back to its full size and power. Font technology has evolved over the years, and the current OpenType “Pro” fonts have a phenomenal amount of intelligence built into them. 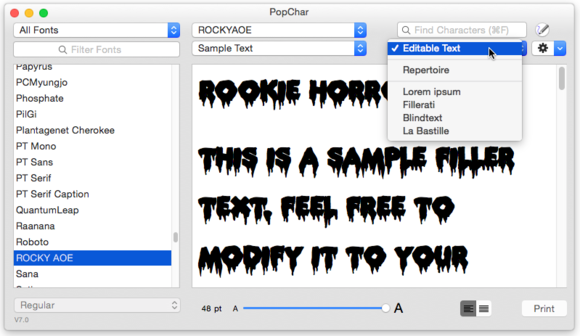 If you have one of these fonts, you can access its features by choosing Typography from the Action pop-up menu. The resulting Typography window shows which (if any) advanced OpenType features are available in the currently selected font. The absolute leader in the field of character-choosing utilities (which admittedly isn’t very large) is Ergonis’ PopChar. This utility for both Mac OS and Windows has an enormous set of features for a price of just 29 euros. (The name is a short for “Pop Character,” because it pops your chosen character into your document.) You can read my 5-mice Macworld review of a previous version here. 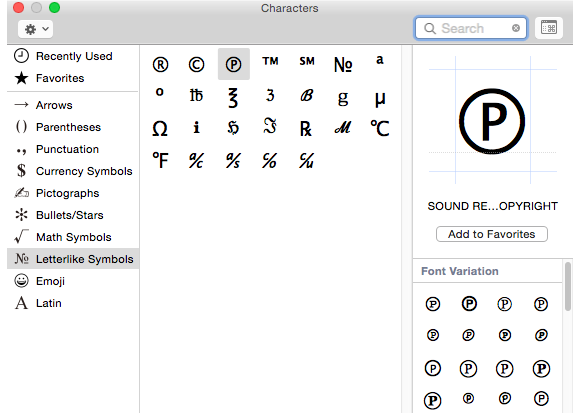 Most of the new features in version 7 involve finding a character without knowing its name, finding a character across multiple fonts, and displaying or printing font samples. For example, if you don’t know the name of a character, you can simply draw it in the new Shape Finder window. 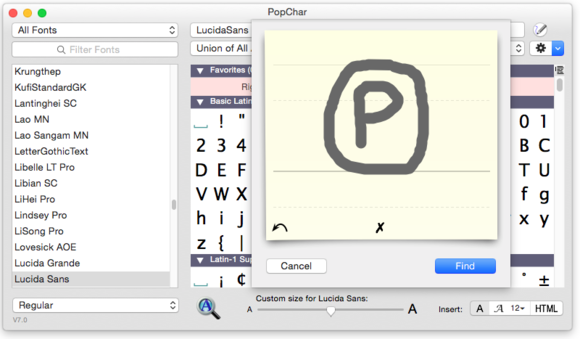 Use your mouse to draw a facsimile of the character you’re looking for, and PopChar will display all the characters that resemble your squiggle. Once you’ve found a character, you can find other characters that are similar to it with the new Find Similar Shape context command. PopChar can find characters that are similar in appearance to another, such as this circle-P. 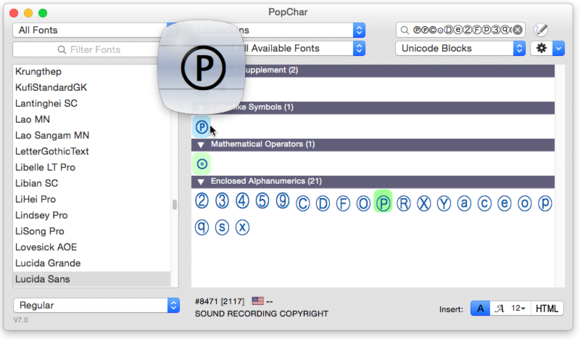 Note that PopChar offers three insertion modes at the bottom of its window: you can insert the selected character as plain text, as formatted text, or as numeric or named HTML codes, a huge help for Web designers. If you Control-click or right-click a character, a context menu lets you copy it to the clipboard in various formats. 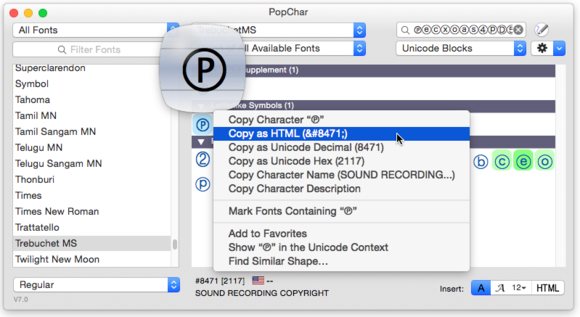 PopChar’s context menu provides access to multiple features for the selected character. 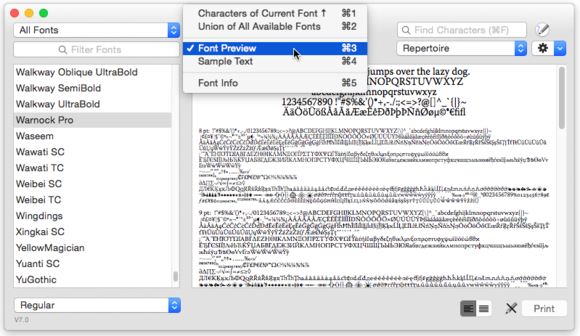 The new Font Preview feature displays all the characters in a font, in multiple sizes. You can even print or save it as a PDF. The new Font Preview feature is super handy. To see which fonts have all the characters you need (for example, characters in a foreign language), just paste those characters into the Sample Text window—those not available in the selected font will be highlighted. Sometimes you need to know more about a font, such as its version number, manufacturer, languages supported, license, and so forth. Clicking the Location info takes you to your font file in the Finder. 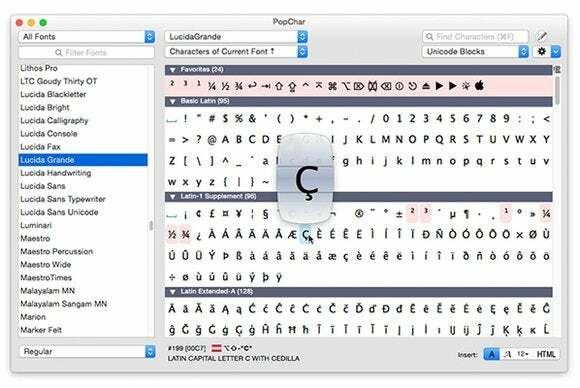 Anyone who works with foreign languages, scientific symbols, or frequently uses picture fonts will find PopChar quickly pays for itself. Graphic designers and publishers will appreciate its ability to display the same character across multiple fonts, and anyone with an interest in the depth of their font collections may lose an evening or two exploring their font treasures.